As the world gets smaller, it seems that of all things, Everest is what gets closer. I know a disproportionate number of people who have been to the Everest base camp. When I was in Nepal volunteering a few years ago, a helicopter ride around Everest was a fairly common tourist activity, if an expensive one (I did not to it). Beyond base camp, though, it seems to be more a matter of money than one of skill to actually climb the mountain. Since the last Everest tragedy, numerous reports have come out from experienced climbers who have watched as first-timers have used oxygen the entire way up, or are learning to belay (a fairly basic technique) on the upper slopes. The reality of Everest today loomed large for me while I read Tanis Rideout's debut novel Above All Things, in part because her ability to carve out the historical grandeur of Everest is all the more impressive for its modern ubiquity. Above All Things is the story of George Mallory's third and final Everest attempt in 1924, and Rideout divides the narrative between the mountain, moving between George's perspective and that of young climber Sandy Irvine, and England, where George's wife Ruth waits for news. The division is beautifully done, and allows Rideout to maintain the tension and suspense of the climb while providing different insights in what was at stake as well as rounder perspective on George Mallory himself. That being said, Ruth's presence in the novel is not simply to serve as a vessel for facts about her husband: she is as deep and broad a character as he is. Rideout's structure goes beyond alternating perspectives, though. In the George chapters, we're taken through all the details of the climb, from the boat leaving England to the people entertaining them on their way through India, to all the set up and intricacies on the mountain, to the climbing itself. His chapters have changing altitudes, varying weather, multiple locations. The Ruth chapters, though, all take place in a single day, as we follow her from waking up in the morning to going to bed at night. This structure does a few things (at least for me). First, it sets up how very far apart they are. News takes weeks (sometimes longer) to arrive in England from the mountain, which makes knowing anything concrete very difficult. Second, it shows how differently time passes depending on what you're doing. For Ruth, waiting at home for news, time drags, and days seem interminable; for George, though, the days are never long enough, and are filled alternately with activity and waiting, but seem always over in a blink. Finally, it juxtaposes the hype and excitement about the climb in England with the realities of the climb itself – both those of the climbers and those left to wait for them. Typically, in this kind of layered narrative, there is one strain of story that hooks you, causing you to race through the other sections so you can continue whatever part is most compelling. Strangely, though, it seemed that whatever voice I was reading became my favourite in that moment. I almost felt I could have read an entire book about Sandy's insecurity, or George's torn desires, or the way Ruth's careful routine was being torn apart by anxiety. But then, none of those books would have felt like the bigger picture the way Rideout's does because, for her, the bigger picture isn't only the climb, it's about the relationship between George and Ruth, which is one of those beautiful and ordinary and enduring love stories that often get forgotten by history. Their memories of each other are one of the most compelling aspects of the story. 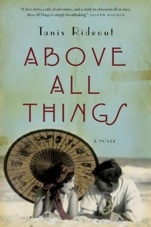 Above All Things is a novel, and although Rideout did extensive research, it is a work of fiction (she notes certain things that she deliberately changed in service of the story at the end). However, because it is based on a real expedition, which had a real outcome (even if you don't know what happened to Mallory, you probably know that Sir Edmund Hillary and Tenzing Norgay wer the first to be credited with reaching the summit of Everest in 1953), you can find out what will inevitably happen in the end. That I could know this and still be so rocked by what happened is a testament not only to Rideout's writing but also to her ability to bring her characters so thoroughly to life. I have never cried like that for a fictional character in my life. Never. 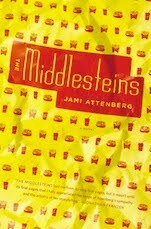 I expected to like Above All Things, which has a lot of literary elements I enjoy: layered narratives from different perspectives, romance, adventure, a basis in fact, and all the small period details and personality-specific traits that make something come alive. I expected to like it, but I didn't realize how deeply involved in it I would get, or how it would make me want to reread all the books I've read about Everest and then seek out more. Without warning, a mountain I've never had a huge desire to visit has taken over my imagination, and even if this feeling doesn't last, I can certainly say that I will never think about Everest the same way again.